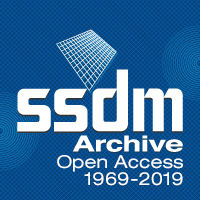 With its 51st annual conference being held in 2019, SSDM is one of the most reputable international conferences regarding science and technology in devices and materials. SSDM covers a wide spectrum of topics related to solid state devices and materials. In order to facilitate active discussion among various communities, the subcommittees have been rearranged and 12 areas have been newly set up last year. Key researchers will also be invited from all over the world. Your contribution is highly solicited from both industry and academia. A special issue of the Japanese Journal of Applied Physics (JJAP) focusing on this conference is scheduled to be published. Exhibition booths will also be set up for companies and agencies that may exhibit devices, technologies and information relevant to the research and development efforts to approximately 1,000 participants. If you are interested in setting up a booth, please contact the secretariat.